Complete a DESIGN YOUR OWN TRAILER survey and tell us what you are looking for. We will send you back a quote. Call 1-800-978-7223 to speak with a design specialist. Enclosed car trailers are trailers that have walls and ceilings and protect the car from exterior hazards. Enclosed car trailers can have living quarters which allow people to sleep in their car trailers. Enclosed car trailers are more desirable than open car trailers because they protect the cargo better and allow for additional storage, security and functionality. Enclosed car trailers allow people to store tools, golf carts and other need car parts. These trailers provide additional security for the cars and other cargo because they allow for doors to be locked and no exterior access can be gained. Enclosed car trailers can also provide for electrical connections, lighting, air compressors and more. In addition to our own brand of Millennium enclosed car trailers, we also offer Pace American enclosed car trailers. 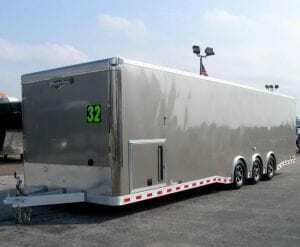 Enclosed car trailers are generally 102″ wide from fender to fender. Interior widths vary based on manufacturer but are generally around 82″. Interior height of an enclosed trailer generally ranges for 6’4″ to 11′. The taller trailers can include a lift to elevate one or more cars. These trailers are referred to as a stacker trailer. Trailer lengths are between 16′ and 32′ for bumper pulls and between 24′ and 53′ for goosenecks. Many people haul their car with an open trailer. An open trailer is a lower cost option and with any lower cost options there are trade offs being made for the lower price. Normally the car is more expensive than the trailer, therefore the cost trade off for the lower price, may in the long run, cost far more if you need to fix damage to your car or the normal weather causes the car to lose its value because it has been left out in the weather. One of the most damaging forces is weather. Leaving a car outside over time makes the paint fade and the finish to deteriorate from rain and the chemicals that mix with the rain. If you car has an expensive paint job then protecting it from rain is very important. An enclosed trailer keeps acid rain away from the car protecting the investment. Cause dents in the car’s body. Some open trailers offer stone guards on the front of the trailer but this leaves the top and sides open. Rocks and other debris tend bounce leaving the potential to still striking the car. The enclosed car trailer protects the car on the front, side, back and top. Most enclosed car trailers have a ATP stone guard on the front to also protect the trailer finish. An enclosed car trailer offers a good place to store your car. The trailer offers the protection of a garage and the flexibility to go mobile. If space is short in the car owner’s garage an enclosed trailer can fix the problem quickly. When designing an enclosed car trailer consideration must be given to securing the car so it does not move. If the car is not secured properly it may move damaging the car and the interior of the trailer. Two main systems are used D-Ring and E-Track. The D-Ring is a simple loop on the floor that allows a ratchet strap to connect to then connects to the car. This is a good method if you know exactly what car you will tow. E-Track offers the flexibility to connect to any where on a metal strip. E-Track is normally a little more expensive to operate. For a lighter car that is not being transported very often, the steel I-Beam solution may be fine. Without a rigorous use the most simple production may be adequate. For hauling a heavy car frequently or hauling multiple cars a tube frame ensures the rigidity of the frame for safety and longevity. Aluminum tube offers a lower weight, therefore hauling frequently and long distances make sense to consider aluminum. The cost for aluminum trailers is higher than steel, but in the long run cost, aluminum may pay for itself. Aluminum also has a higher resale value which would also contribute to a lower long run total cost of ownership. Thank you for reading we hope you found this information useful and will consider Millennium Trailers for your next purchase. We have qualified design specialists to assist our clients in getting the best value for their purchase.